I am now mapping this Commodore 64 game. This is going to be a HUGE map. It will be about 7000 pixels wide and I don't know how long it will be. I'm doing this map in sections to be put together later. Here's what I got so far. These are scaled down. You seem to enjoy large continuous overworld don't you KingKuros, what with this and all three Wizards And Warriors ? Here is a clip of this game being played on YouTube. Whoa, thanks for the video link. Objectively, it looks like a very boring and frustrating game to play, but I imagine that technically it was impressive when it came out. I don't imagine that there are many C64 game with free scrolling like that. Anyway, I hope for your sake that the whole map isn't something like twice the size of what you've mapped so far. How long have you been mapping this considering how much you've done? I got started on it last week some time. I usually post here about what game I'm mapping on when I'm well into it. I'll repost that second part of the map at the end of the day to show what more I got. I'll also keep you updated on what more clues I found. Supposedly, nobody ever answered all the riddles which were part of a contest, right? I can see how anybody could get lost, even with a map. Whoa. I see there will only be 4 colors. Black, brown, red, and yellow. Here's what I got now on the second part. 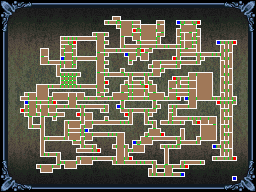 Do you think that you could make a Metroid-style minimap for this too? Basically its just a fancy grid that labels important points. Here's what I got now this section. I'll start a 3rd section after I get the rest of it filled.